Sports teams and airplanes are nothing new so what makes this any different? The Raiders already have an airline partnership with Hawaii Airlines so the deal is "non-exclusive." In fact, Raiders CEO noted this as a positive, telling the Examiner that the deal was something of “a first’’ because other planes painted in team logos were from airlines that were official carriers of the team, had some other direct affiliation or carried the team to away games. None of which appears to be the case in this instance. Air Asia does not even serve the United States and has stated that it has no plans to do so in the near future. Currently the carrier serves Malaysia, London, and Australia. 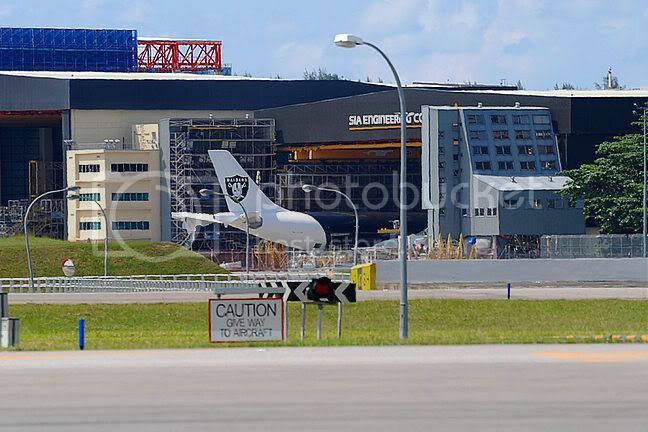 Trask recently joked to a reporter "if you buy a plane you can paint it in Raider colors, too." In fact, the organization may be laughing all the way to the bank as the deal is rumored to be valued at 1Million RM, which comes out to about $280k U.S. Add this to the fact that the Oakland Raiders now may have the opportunity to get exposure to new markets without signing an exclusive and the deal looks pretty good for them. Many in Air Asia's home country however, including the Olympic Council of Malaysia (OCM), are not happy about the deal as they have made it known that sponsorship dollars could be better spent closer to home. In any case, some speculate that AirAsia could be opening up a new route and just wasn't ready to announce it yet when the painted aircraft was discovered, in which case someone is probably in a lot of trouble. The Examiner, however, states that they have no intention to do so. Perhaps we're completely missing the strategy here and we'll find out more at an official press announcement tomorrow. In the meantime, help us out and give it a guess in comments.